Slept very well last night, but was still super tired on waking up and kept hitting snooze. Eventually I dragged myself into the shower, which made me cold again (the room was cold and the shower wasn’t producing enough water to warm me up) so I had to crawl back into bed to warm up before venturing out for breakfast. Today’s croissants were just as lame as the last time we stayed here, but the coffee was actually tasty today, and I bought a carton of “multifruital” juice (pear, orange, banana and pineapple) and breakfast was surprisingly decent. As usual, we didn’t hit the road until 10AM. No idea what took so long this time, as the internet we were planning to use to update the posts last night went out when the power went out, and never came back on. So we had no internets since like 7PM yesterday, and didn’t get to do any of our normal net stuff. I assume we were just late getting out because I was tired and cold. It was immediately apparent upon hitting the road that it was *windy. * Typically, it’s been calmer in the morning and then gets windy in the afternoon – anywhere between 1-3PM the wind seems to pick up. It was as windy this morning as it has been most afternoons, and as the day wore on, it just kept getting more windy. Unfortunately, my neck hadn’t recovered from yesterday’s wind, so by the time we got to Fitz Roy, around 130km north of Tres Cerros, I was in real pain. Having the wind blowing against your helmet all day at the same angle creates a surprising amount of neck pain. I wished my head would pop off just to make it stop. This time, Fitz Roy had gas, but the store was closed which meant I couldn’t get in to use the restroom. The gas station guy said I could go a couple of blocks away to the visitor’s center, but I didn’t want to deal with gearing up to ride a few blocks so I told Kay I’d wait till we got to the next town north, about 85km. And of course, 20km later, I had to pee, so I asked to pull over and ducked behind some bushes. Did I mention that the wind had picked up? Yeah. As I was walking back to the bikes, the wind lifts my bike up and over vertical to fall down sideways. The wind literally pushed my bike over. It fell over past the pannier and the poor little side-stand was up in the air looking all sad… like “I was trying to do my job! See! I didn’t fail!” But the wind was just too strong. It took Kay and I some hauling to get the bike lifted again uphill, and once we did, I made Kay stand next to it until I got mounted up and could support it myself and keep it from falling over again. It was WINDY. More riding in the wind, and a minor detour into Caleta Olivia led us past a gas station with a cafe. At this point, it was nearing 1PM and I was getting hungry, not to mention very much craving a break from the wind, so we went in. Had a lomito completo, which is a wonderfully tasty sandwich… in this variant, it was beef, ham, cheese, lettuce, tomato and a fried egg. A ton of food, but after breadfast, it was welcome. Back on the road, and I told Kay I’d probably have to stop for the day in the next town. The wind was killing my neck, and was blowing us all over the road. It’s the worse wind we’ve had so far in Patagonia… up until today, I was beginning to think all of the people who complain about the wind in Patagonia were exaggerating. 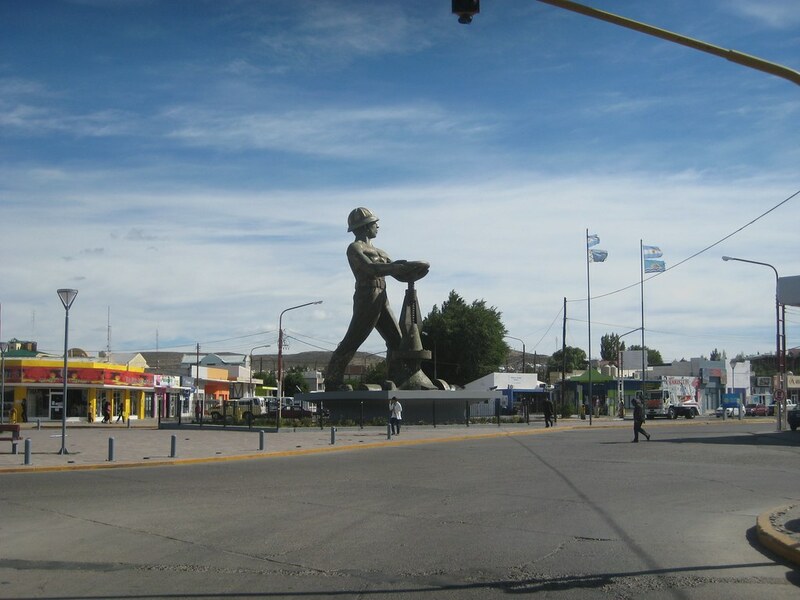 The next town was Comodoro Rivadavia, and it was only something like 90km down the road. That would put our total mileage for the day at around 180 miles, and it would have us stopping for the day at around 3PM… with still nearly five hours of daylight left. But the next place north of Comodoro Rivadavia on my map was over 200km north, and I knew that with the wind blowing as hard as it was, I just didn’t have it in me to ride that far before stopping. Kay was very patient about my request, and it turned out to take a while to find a hotel and get settled anyway, so it was nearly 5PM before we got the stuff loaded into the room. Kay’s note: Dachary said “I feel ridiculous stopping at 3 o’clock but I just don’t have it in me to do another 150k to the next town.” I didn’t blame her. The wind’s just tiring. On the bright side, the hotel is right down from a sewing shop, and I had Kay grab a needle and thread so I can fix his Airhawk straps. I was determined to make the early stop count for something. The hostel also has internet, so we could update the blog and do a few administrative things, which is good since we haven’t really had net for the past several days. So yeah. I feel a little lame for being defeated by wind, but this is no ordinary wind in Patagonia. This is two days in a row of really strong side winds that yank your head up and back no matter how you move your helmet (although pointing down and to the left seems to help a bit) and buffets you across the road at a whim. Hopefully the wind calms down a bit before tomorrow morning. If it doesn’t, I assume that a good night’s rest and a liberal dose of Advil will help my neck relax before tomorrow and hopefully make it a bit easier to ride in whatever wind we encounter. 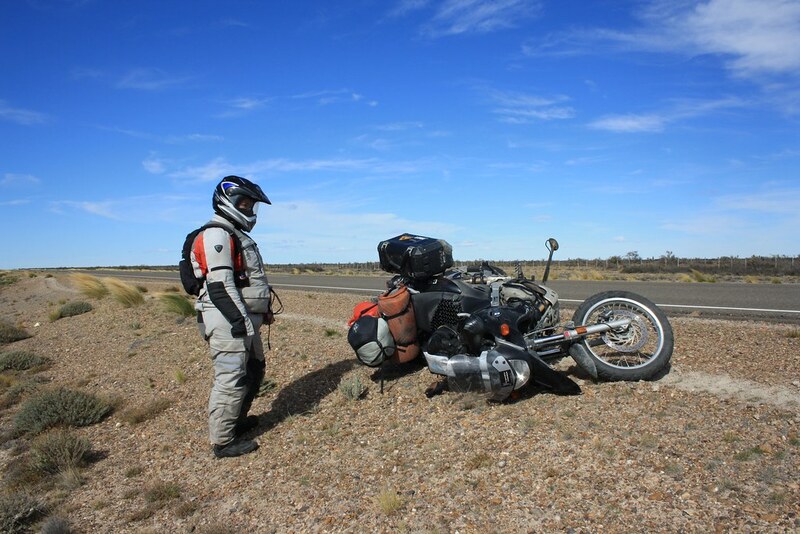 Kay’s note: the riding yesterday, and today up to Caleta Olivia was flat and… flat. The only things of note were the llama-deer that kept jumping into the road and not-emus that kept being exceptionally well camouflaged.